Shopping groceries are one of the things that we need to do many times. Below are some saving tips. If you have some more just feel free to add them. When shopping, you should try generic products. Sometimes they taste exactly the same or even better than the branded products. Compare the ingredients on the back of the package, to see how similar the generic product is to the branded product. Check and compare the price to see how much you could save, and give it a try. There are many coupon options for groceries in the Sunday newspaper, online, and even attached to the boxes on the foods you purchase. You also may be able to use your cell phone to scan coupons you have on your phone. There are many other new dollar apps for your cell phone on the market, that allow you to receive a rebate for purchasing select items when grocery shopping. Once your reach the requested amount in savings, you can cash out to receive a rebate check. Many of the groceries have temporary store specials posted on their shelves. Choosing the products listed for their specials can save you a lot of money. If your grocery store has a point card, look for those as well, to bring the price down. Doing this is just as important as using a clipped coupon. 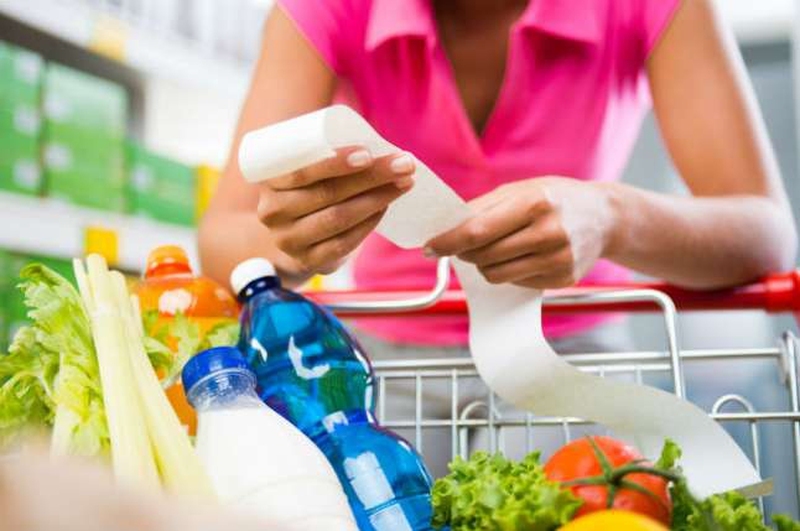 This may cause you to do some extensive research, but determining which stores in your area run in a lower price range for groceries that you purchase regularly will bring the price on your grocery receipts down noticeably. This may mean in some cases using one store for a certain group of groceries and another for the rest on your list. But shop starting on the top rows and bottom rows, because that is where the cheaper brands are usually stored. When you want to find fresh fruits or vegetables that are less expensive, look for the ones that are out of season. They will still be fresh, but they cost less because less people are looking to purchase them. Fruits like apples are cheaper in the summer, and peaches are cheaper in the winter. Knowing the fruit seasons can be very helpful.